This book presents an interdisciplinary examination of cross-Taiwan Strait relations and the complex dynamics at play in the region. Since the election of Ma Ying-jeou as Taiwan’s president in 2008, the relationship across the Taiwan Strait—long viewed as one of Asia’s most volatile potential flashpoints—has experienced a remarkable détente. Whether the relationship has been truly transformed, however, remains an open question and the Taiwan Strait remains a central regional and global security issue. A return to turbulence in the Taiwan Strait could also add a new dimension of instability in the already tense maritime disputes in the East and South China Seas. While the relationship across the Taiwan Strait remains critically important, it is also changing rapidly, and the chapters in this volume present new thinking to help make sense of complex cross-Strait dynamics. 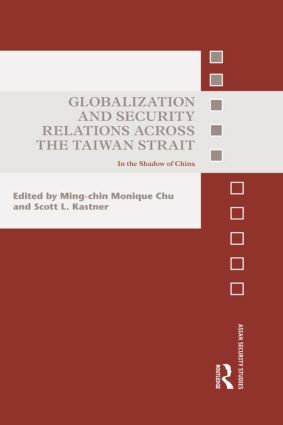 Specifically, these essays explore different security and/or globalization dimensions of China-Taiwan ties as well as the globalization-security linkages that have emerged. As the balance of power in Asia shifts dramatically, several chapters in this volume explore how traditional security forces are evolving. At the same time, there are new dynamics emerging as a consequence of globalization forces, such as the tremendous economic and social integration across the Taiwan Strait, and several chapters in this volume consider some of these new problems. Finally, several chapters consider the often under-researched dynamics associated with the globalization/security interface such as cyber threats, transnational criminal networks and the security spill-over impact of production globalization. This book will of much interest to students of Chinese Politics, Asian Security, globalisation, diplomacy and International Relations. Ming-chin Monique Chu is Lecturer in Chinese Politics at the Department of Politics and International Relations at the University of Southampton. She is author of The East Asian Computer Chip War (Routledge, 2013) and has a PhD in International Studies from the University of Cambridge. Scott L. Kastner is an Associate Professor in the Department of Government and Politics, University of Maryland, College Park. He is author of Political Conflict and Economic Interdependence across the Taiwan Strait and Beyond (2009). Few regions of the world are fraught with as many security questions as Asia. Within this region it is possible to study great power rivalries, irredentist conflicts, nuclear and ballistic missile proliferation, secessionist movements, ethnoreligious conflicts and inter-state wars. This series publishes the best possible scholarship on the security issues affecting the region, and includes detailed empirical studies, theoretically oriented case studies and policy-relevant analyses as well as more general works.